I have several posts I would like to do, but this month has been very hectic. This encouraged me to revise how I deal with my tendency to overcommit myself with new projects, while managing to accomplish deadlines and still not working on the weekends. The result is that I am posting this instead of other alternative posts. See why. 1) Externalize fun work for out of the office. When I arrive home I play with my daughter so there is no way I can do actual computer work there. However most of my work involves thinking. I can think in many places. My favourites are on my bike on the way to work or when running. I not only think about work then, I also wonder about other stuff or picture myself in a tour de france time trial. However, I find that some fun problems are better solved in that context. Why? Because if you don’t come up with an idea in 5 minutes while sitting in front of your computer you feel desolated, but is ok to not have ideas if you are already doing something (e.g. running). Also, because if you are on your computer you tend to try (and put hands on) the first thing your intuition tells you will work. This way is easy to get lost in the details or do overcomplicated things that won’t work at the end. However, while running, you are forced to develop all the steps necessary and abstractly think if they will work discarding bad ideas way faster. Plus, blod is pumped to your brain continuously boosting your potential (or this is what I hope). But take notes as soon as you get out of the shower! 2) Minimum effort rule. I usually start by the task that requires less time to be completed. That way I can take it off my list and maximize the chances to move on any project. If I can solve something (e.g. a review or a simulation for a coauthor) in 1 to 4 hours, I just do it and have it done fast. Answering a question by email? I’ll do it asap and archive it. This short tasks are usually related to collborations and that also make happy those people and allow the project to keep moving. 3) Block time. The minimum effort rule fails when you start spending most time completing short tasks so there is no time left to work on long daunting (but exciting) projects. Then, I decided to block at least 2-3 full mornings or days a week to work on that kind of long term projects. No answering emails, no improvised meetings, no multitasking on the blocked time slots. I thought about that post on my bike ride this morning, I knew it will be written fast, so I did it as soon as I have some spare time, but not this morning. This morning was blocked to do some other analysis. I’m still on the process, so comment on what works for you! Is there a pollination crisis? After some months writing this blog, finally I can do some self-promotion and post about our new article just published in PNAS. Do you think we are experiencing a pollinator crisis? Take note of your answer and keep reading. In this paper, we show that most Northeastern US bee species persisted along the last 100 year. And those are 100 years that has transformed the landscape dramatically. However, we show that community composition changed markedly. The loser species are some big species, often specialists and with short activity periods. See a quick figure I made trying to capture the essence to outreach people who only have one minute to spare. So, what that tell us about a possible pollination crisis? A crisis is something that leads to an unstable and dangerous situation, in this case regarding the fate of pollinators and the service they deliver. Nobody talks about a bird crisis. Some bird species are doing great, some are threatened with extinction, but nobody would dare to generalize about the fate of all bird species as a whole. I think is time we take the same approach with such a diverse group as the pollinators (including bats, birds, butterflies, bees and a long etc…). In this paper we show that some bumblebees (e.g. Bombus impatiens) are doing great, while others are on the brink of extinction (e.g. Bombus affinis). 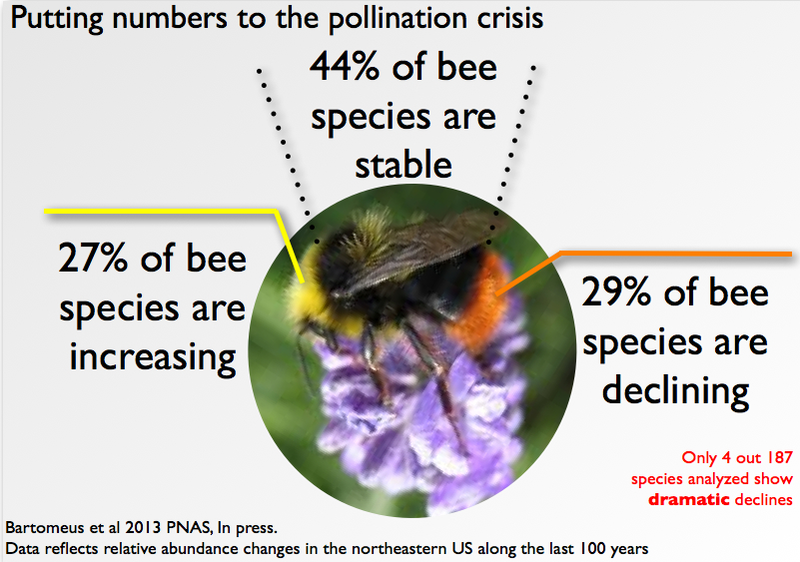 We need to understand better species responses and stop crying wolf for all pollinators. There is a fine line between raising general aware among citizens about the importance of pollinators and their conservation and an overestimated alarmist call. Every time a farmer reads about the pollination crisis while seeing that his field is full of bees buzzing around, we (scientists) are loosing credibility. Moreover, if is crop pollination and food security what concerns you, it may be that the winner pollinator species, those that thrive in human dominated landscapes, are also the best ecosystem service providers. And if it’s biodiversity (and its overall functioning) what you want to protect, then we should look at which species/habitats needs maximum conservation. We need to move forward and pose the relevant questions, instead of looking for a general declining pattern that hopefully is not really there. I am expanding too much for my taste, so more on that next week. But to make clear my point: we need to keep studying pollinators (keep funding me! ), but next time you cite worldwide pollinator declines, cite me also (i.e. Pots et al 2010, but see Bartomeus et al 2013). *Giving the importance of the subject, it was specially important for us to make all historical bee data available @datadryad (dx.doi.org/10.5061/dryad.…) for further analysis and replicability.